Michael Jackson’s teenage daughter was ‘overwhelmed’ with teenage turmoil before her attempted suicide on Monday – just weeks before the fourth anniversary of her father’s death. Paris Jackson, 15, cut her wrists and took a drug overdose, according to reports. 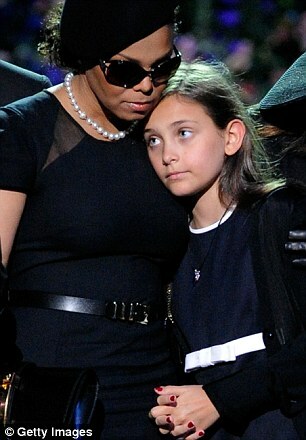 The teenager had become ‘overwhelmed’ with sadness over the loss of her superstar father, said a friend of the Jackson family. She is also in the middle of doing her exams at school and is anxious over her looming appearance in court in Los Angeles where she is due to testify in a trial connected with Jackson’s fatal overdose on June 25, 2009. In addition, sources said she was upset at not being allowed to go to a concert by goth rocker Marilyn Manson tonight. She ‘threw a fit’ after being told she couldn’t attend the concert on a school night and reportedly ran into her room screaming and slammed the door. Paris is going through a difficult time and has had ‘a lot going on lately’, her mother Debbie Rowe, who was pictured speaking to police on Wednesday outside her Palmdale ranch in California. The teen has posted a series of dark messages on Twitter over recent months. The drama unfolded just hours after the teenager posted a series of alarming messages on Twitter. The backdrop to her Twitter page shows Vincent Van Gogh’s The Starry Night, painted while the artist was in a mental asylum in Saint-Remy, France. 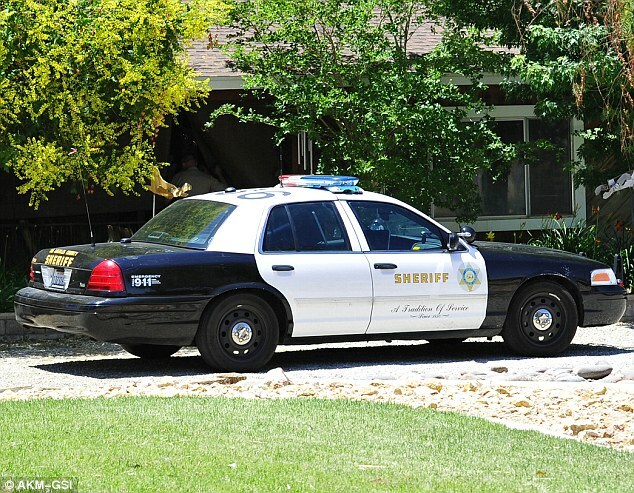 Scott Miller of the Los Angeles County Fire Department said an emergency call was made from the Jackson family compound in Calabasas, California, at 1.27am yesterday ‘regarding a possible overdose’. 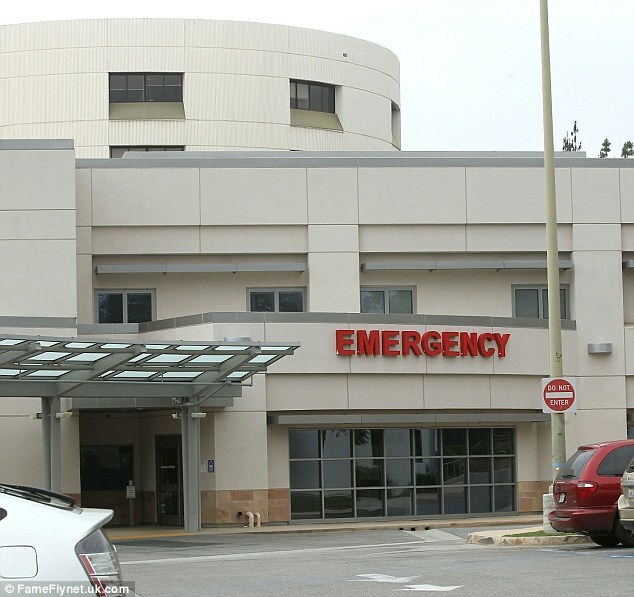 Paris was taken out of the house on a stretcher at 2am and rushed by ambulance to a nearby hospital. According to celebrity website TMZ, a source connected to the emergency response said there were multiple cuts on one of the victim’s wrists. Katherine Jackson and other family members were at Paris’s hospital bedside yesterday. Her life was not thought to be in any danger. Jackson, who died in June 2009 from a lethal dose of surgical anaesthetic propofol, was married to Rowe from 1996 to 1999. Rowe, 54, met Michael when she was a nurse for Dr Arnold Klein, the singer’s dermatologist. The pair had two children together, Prince Michael, now 16, in 1997 and Paris in 1998. Jackson later had a third child, Prince Michael II, also known as Blanket, who is ten. Rowe turned over full custody of the children to Jackson as part of their divorce but she had recently rekindled her relationship with Paris. Rowe wouldn’t comment further on the incident yesterday. ‘We appreciate everyone’s thoughts for Paris at this time and their respect for the family’s privacy,’ said her lawyer Eric George. But in recent days, her tweets have been increasingly bleak. ‘Don’t listen to a word i say the screams all sound the same,’ she tweeted on Monday from the song Little Talks by Of Monsters And Men. The years since Jackson’s death have been anything but tranquil for the star’s children as they have faced one drama after another. Last year, the turmoil broke into the open when Paris and her two brothers were ambushed by the singer’s siblings and separated from their grandmother. It later emerged that Katherine was taken to her oldest daughter Rebbe’s home in Arizona. Friends said Paris has been battling depression since her father’s sudden death. ‘It’s very real and very sad. She has been extremely depressed and not been able to sleep lately, staying up all night,’ an insider told Us magazine. 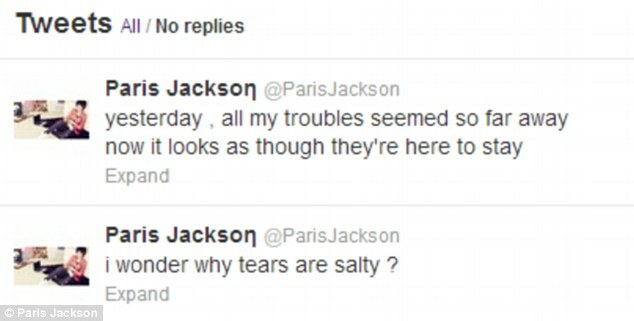 Paris is listed as a potential witness in a £26.5billion lawsuit currently being brought by the Jackson family against AEG Live – the promoters behind her father’s doomed London O2 comeback tour. The wrongful death suit, launched by Katherine Jackson and her three grandchildren, says the singer died from an overdose of prescription drugs after a punishing schedule of rehearsals prior to the tour. Now in its sixth week, the trial has resurrected upsetting details surrounding the death, including the star’s dependence on drugs and his frail condition at the time of his death.